One of the first acts of a sovereign nation has always been to establish a system of currency for use in commercial transactions. In the fledgling United States this was doubly important. Although the accepted standard of value was the Spanish silver dollar and its fractional pieces of eight, English coins of pounds, shillings and pence also were in use throughout the young nation. Efficient trade was hampered at every turn, particularly between the states, as each valued the Spanish coins differently in relation to English issues. By the end of the 1780s, much discussion ensued concerning the necessity and structure of a reliable, non-fluctuating system of coinage. Thomas Jefferson, along with Alexander Hamilton and financier Robert Morris, had long advocated the use of the decimal system. Introduced by the Dutch inventor Simon Stevin van Brugghe, it used whole numbers to describe fractions and was translated into English in 1608 as Disme: the art of tenths, or, Decimall arithmeticke. Jefferson saw decimal coins as the solution to the conflicting foreign systems already circulating in North America. The gold ten-dollar piece would be roughly equal in value to the British double guinea. The silver dollar and its fractions would correspond to the Spanish eight reales. Copper cents would be equivalent to English halfpennies. The Mint Act passed by Congress on April 2, 1792, provided that ". . . the money of account of the United States shall be expressed in dollars or units, dismes or tenths, cents or hundredths, . . . a disme being the tenth part of a dollar . . ." It was fitting that this country, born of revolution, should use a revolutionary system for coinage. The first decimal coins struck were the William Russell Birch designed pattern half dismes of 1792. Only fifteen hundred were minted. Most likely, as the late Walter Breen postulated, minting half dismes was the most economical use possible of the $75 worth of silver bullion that was on hand at the time. But this small mintage was only an experiment. After the poor reception afforded Scot's creation, Mint Director Henry DeSaussure addressed the immediate need of improving the coinage. Going outside the Mint, he engaged artist Gilbert Stuart to submit a sketch for a new Liberty head. Stuart modeled his Liberty after the buxom Mrs. William Bingham of Newport, Rhode Island. Using Stuart's sketch, transferred to a relief model by John Eckstein, Scot engraved the dies for the new half dime. 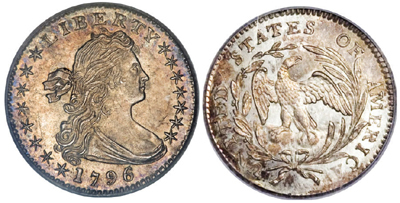 Released in 1796, the coin's obverse design consists of a Draped Bust profile of Liberty facing right, with flowing hair secured by a ribbon. The word LIBERTY is above her head, and the date is below the bust. Stars flank each side. The coin's reverse depicts an open wreath surrounding a small eagle that is perched on a cloud. The eagle is smaller than the one on the Flowing Hair design of 1794-95, but it has a fuller breast. The inscription UNITED STATES OF AMERICA surrounds the wreath. The 1796 half dime has eight stars on the left and seven on the right, representing the fifteen states, including the new states of Vermont (#14) and Kentucky (#15). In 1797, a fifteen-star variety was struck, and later a sixteenth star (eight right, eight left) was added after Tennessee was admitted to the Union on June 1, 1796. Director DeSaussure's successor, Elias Boudinot, realized that they couldn't go on adding stars ad infinitum, so the last variety of 1797 had only thirteen stars (seven right, six left). Henceforth, thirteen stars would be used to symbolize the original union of states. There were 54,757 half dimes of this design minted. Only a few varieties exist, and all are rare. Even type collectors find this issue a challenge. In 1796, there is a late die-state example with a broken "B" in Liberty that appears as "LIKERTY" and an overdate, 1796/5. The 1797 coins were minted from only three obverse dies having either fifteen, sixteen or thirteen stars. No proofs were made, but supposedly there is a single 1797 fifteen-star prooflike presentation piece that can be traced back to Mint Director Boudinot. It was sent to Matthew Boulton in England as an example of the Mint's capabilities. It was last reported in the collection of Harold Bareford but did not appear when his coins were auctioned in 1981. One reason for the paucity and low quality of coinage during this period was the yearly outbreak of yellow fever in Philadelphia during the summer and fall months. The epidemic was particularly ferocious from 1797 through 1804, and during some of these years the Mint was temporarily closed throughout the yellow fever season. Key employees-engraver Joseph Wright and assayer Joseph Whitehead-succumbed in 1793, and Mint Treasurer Dr. Nicholas Way was felled in 1797. Official procedures were instituted for closing the Mint in these emergencies, including provisions to pay off the workers and instructions for coining or securing the bullion that remained on hand. All dies were to be packaged and sent to the Bank of the United States for safe keeping. It should be noted that most Draped Bust/Small Eagle half dimes are usually very weakly struck, particularly in the center of the coin. This presents a grading challenge, as the typical specimen may grade only Fine. Wear first shows on the hair above Liberty's forehead, at the hair over her ear and shoulder and on the area where the bust meets the drapery line. On the reverse, check the center of the eagle's breast and the ribbon. Draped Bust half dimes typically show adjustment marks made with a file to bring slightly overweight coins to the proper standard. This process of adjustment was done before the coin blanks, or planchets, were struck by dies into coins. Each blank was weighed, and overweight pieces were filed with strokes across the face of the blank, while underweight pieces were melted. Though adjustment marks are not a major factor in grading, they must be recognized so that they are not interpreted as damage to the coin. No half dimes were struck in 1798 and 1799. The coin was again minted in 1800 with the same Draped Bust obverse, but with a new reverse by Robert Scot that copied the heraldic eagle device from the Great Seal of the United States. Coin Information Provided Courtesy of NGC.